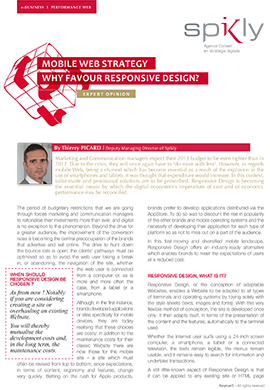 KEYRUS | Mobile Web Strategy: Why Favour Responsive Design? Mobile Web Strategy: Why Favour Responsive Design? Marketing and Communication managers expect their 2013 budget to be even tighter than in 2012. Due to the crisis, they will once again have to "do more with less". However, as regards mobile Web, being a channel which has become essential as a result of the explosion in the use of smartphones and tablets, it was thought that expenditure would increase. In this context, tailormade and provisional solutions are to be proscribed. Responsive Design is becoming the essential means by which the digital ecosystem's imperatives of cost and of economic performance may be reconciled. The period of budgetary restrictions that we are going through forces marketing and communication managers to rationalise their investments more than ever, and digital is no exception to this phenomenon. Beyond the drive for a greater audience, the improvement of the conversion rates is becoming the central preoccupation of the brands that advertise and sell online. The drive to hunt down the bounce rate is open: the clients' pathways must be optimised so as to avoid the web user taking a break in, or abandoning, the navigation of the site, whether the web user is connected from a computer or, as is more and more often the case, from a tablet or a smartphone. Although, in the first instance, brands developed applications or sites specifically for mobile devices, they are today realising that these choices are costly: in addition to the maintenance costs for their classic Website there are now those for the mobile site – a site which must often be revised from top to bottom, since expectations, in terms of content, ergonomy and features, change very quickly. Betting on the rush for Apple products, brands prefer to develop applications distributed via the AppStore. To do so was to discount the rise in popularity of the other brands and mobile operating systems and the necessity of developing their application for each type of platform so as not to miss out on a part of the audience. In this fast-moving and diversified mobile landscape, Responsive Design offers an industry-ready alternative which enables brands to meet the expectations of users at a reduced cost. Responsive Design, What Is It? Responsive Design, or the conception of adaptable Websites, enables a Website to be adapted to all types of terminals and operating systems by toying solely with the style sheets (texts, images and fonts). With this very flexible method of conception, the site is developed once only. It then adapts itself, in terms of the presentation of the content and the features, automatically to the terminal used. Whether the internet user surfs using a 24-inch-screen computer, a smartphone, a tablet or a connected television, the texts remain legible, the menus remain usable, and it remains easy to search for information and undertake transactions. A still little-known aspect of Responsive Design is that it can be applied to any existing site or HTML page regardless of the content management system (CMS) used. In other words, a site which is not "responsive" can be made so, and thereby not only protect earlier Web investments but also maximise their impact, notably by avoiding the development and the maintenance of a mobile application. Creating a new site in Responsive Design or making an existing site "responsive" requires extensive thought to be given to the uses, expectations and forms of behaviour of target web users depending on whether they are in a mobility situation or not. The size of the screen is not the only parameter to take into account ! Above all, it is necessary to determine the possible differences in needs between the mobile user and the classic user. The relevant answers can vary considerably from one brand to another, from one sector to another. For example, should an insurance company put forward its entire offering of products and services on mobile devices? Is it not better for it to emphasize, on the home page, the point of access to the client space, the number of the call centre, or even the address of the closest branch? By the same token, should an e-Trader emphasize, on the mobile interface, the promotions, the search for products or the monitoring of orders? Webanalysis shows itself to be valuable in identifying the dominant uses of web users and their preferred pages, so as to optimise the interface proposed on the mobile devices accordingly, whilst at the same time remaining faithful to the "look & feel" of the brand. One of the objectives behind the preliminary work is to consider alternative contents in certain cases. For example, whereas one can very easily handle the opening of a "pop-up" on a computer, the same cannot be said on a mobile, where the downloading time absolutely has to be very short. Another example: the menus which drop down when the mouse passes over them do not work on tactile interfaces. They therefore have to be rethought. The advantage of a "responsive" approach is to be able to reinvent the part of the Internet navigation intended for mobiles, without developing the rest all over again. So, Mobile Applications or Responsive Site ? Opting for Responsive Design allows one to have a single site which is adapted to all mobile terminals, and to thereby meet the requirement of today's web users that all contents be permanently accessible "anytime, anywhere, any device" (ATAWAD). The need for universality and the wish to contain costs are clearly points in favour of Responsive Design. Yet certain debates present Responsive Design and mobile applications as alternatives. In our view, there is no reason to present them in this way. A mobile application can represent a high-added – value complement for the user, notably by giving him offline use. On the other hand, forcing a mobile internet user to download an application often requiring a Wifi connection so as to be able to access contents can be counter-productive, even off-putting, particularly if it is the first time the user is connecting from a mobile. Moreover, brands are gradually weighing up the constraints imposed by the key online stores when it comes to publishing their mobile applications – whether it be Amazon's Store, Windows Marketplace, Apple's AppStore or Google Play: the absence of Google indexing which deprives them of any SEO (Search Engine Optimization) advantage, the regulated access to information about the users, the possible payment of an annual fee. Added to these constraints are the risk of seeing its applications withdrawn from the Store overnight and a level of visibility of the applications which depends largely on their ranking, the problem being that the ranking is not always representative. In addition, the brand does not really have control over the distribution of its mobile applications. It adds to the costs of development and maintenance by being obliged to offer a specific version for the main platforms in the market. The Right Reflex Today: Responsive First! improve the rates of return on its e-mailing campaigns: the mobile internet user who logs onto a "mobile friendly" site is inclined to stay on it longer. In a second phase, a mobile application can serve to enhance what is offered by proposing a richer relationship experience between the brand and the loyal web user. Typically, it will allow them to access their client space and to undertake transactions, for example, to place an order or upload a photo. Having been identified via Webanalysis, those pages of the site which are the most appropriate for "appsurfing" will then invite the mobile internet user to download the application, with a link to the appropriate Store. The offering can then be enlarged to include complementary applications for other uses, be they temporary or permanent (advergames, household consumption white label comparison tools, QS app… ).